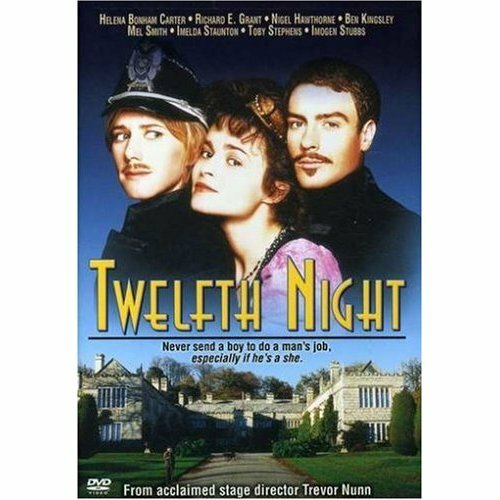 The theme of 12th Night didn’t really hit me until I watched the brooding and over-dramatic opening to this filmed version directed by Trevor Nunn. Non-sequential and interpolated from later backstory, it causes the play to stumble out the gates from a contextual weight that takes time for the otherwise breezy story to shed. It’s a a romp, a sendup, a mockery, a debauch, a celebration and ultimately a surrender to love’s fate being in the hands of destiny or the gods or whomever the powers that be (and quite fitting for St. Valentine’s Day, don’t you think?). I could see the play as perfect material for Blake Edwards, who directed the rollicking early Pink Panther movies — or maybe Hal Ashby, with a dry, deadpan wit so captured by the marvelous and sorely missed Sir John Gielgud. That said, it may have taken me awhile to warm up to this version, but before long I fell madly in love with the casting. Who can argue with Ben Kingsley as the Fool? Or as anyone? His stripped, weathered and sardonic take on the jester is a riot, his singing a revelation. As in the play, he becomes the character you miss most when he’s not onstage. This also occurred to me when I was watching, but that I missed while I was reading: who but the fool to make sense of love’s chicanery? He belongs in this play… he’s vital to this play… for he alone recognizes the nonsensical quality it brings to our lives. It gooses our reason, fondles and pinches our serious aspirations beneath the table. If love makes fools of us all, who better than the fool to sort the madness out? And yet, while watching Kinsley play his character with such aplomb, I also realized something else that I missed from the play: there is a sadness to the fool as he observes others caught in the emotional whirlwind: he alone is unaffected by the pangs of the heart. Detachment is his stock in trade — but oh, there’s a cruel irony and a heavy price to pay for it. While I wasn’t smitten by Helena Bonham Carter’s Ophelia, I delighted in her as Olivia. Her beauty here is just that side of rarified that makes it so convincing as the distant object of Count Orbino’s obsession, and yet she transitions so easily into the smoldering pursuer of the trapped and suffocating Viola/Cesario. In scene after scene, she balances her roles so well, one minute arched and distant from the hot pursuit of the lovelorn count, while in the next falling madly for the “boy” whose wordplay matches her own. She is captivating and magical in this role. Toby Stevens is a riot as the overwrought Orsino. He’s pouty, hunky, smitten and bitten. He could easily transition into a pitch-perfect Pepe le Pew. I could rave on and on about the rest of the cast as well: Nigel Hawthorne as a vexed and vexing Malvolio; Richard E. Grant as an effete and blundering Sir Andrew Augecheek; Mel Smith as a riotous Sir Toby Belch. The casting here is spot on. I did not love Imelda Staunton’s Maria, perhaps because I loved her on the page too much. She was more matronly and guarded here than I was expecting. Less playful and the feminine match for Toby’s punch-drunk outrageous behavior. Perhaps she suffered through editing, but her character seemed to change gears on a dime. I didn’t feel the chemistry between Maria and Toby at all. I’m blaming it on Maria — but it could be that the two just didn’t fit together the way they should. If there’s a weak link here on the whole, it’s the thorny casting demands of the twins, Viola and Sebastian. Viola has an almost impossible task: convincing the characters that she’s a man while maintaining the secret that she’s a woman. Even on the page, where you can suspend your disbelief, you wonder how that would look in real life. An audience at a play must forego a bit of realism for the play to work. The central farrago has to be credible or all falls apart. Thus, Olivia must confuse the sister for the brother while Orbino fails to recognize the girl as a boy, even as he pulls her ever closer into his inner circle. And here is where we come full circle, in that the movie is bitten by its central directorial decision: by going for realism, the setting and backdrop become reality. And measured by reality, the tomfoolery of Twelfth Night suffers — if only slightly — from the grounding of its wings. Certain elements, like Ben Kingsley’s Fool, are enhanced by the realistic setting. He is a mature fool, a bittersweet fool, and in this way steals the whole show. It adds to the elements already there in Shakespeare’s presentation, gives it an extra twist that makes you come away with added meaning from the reading and the play, which is what a good film ought to do. And so, when all is said and done, I was delighted and captivated by this performance, and recommend it heartily to all who wish to watch it. I would just warn not to be too dismayed in the beginning by the weight and substance which serve as the setting. For the point is still — and even more so — to banish the prude and Puritan in our spirits that would squander and limit love. And to remind ourselves, before it’s too late, that the whirligig of time will bring in his revenges for the fancies of our youth. This entry was posted on 2010/02/01 at 6:48 am and is filed under Movie Reviews, Twelfth Night with tags Helena Bonham Carter. You can follow any responses to this entry through the RSS 2.0 feed. You can leave a response, or trackback from your own site. Just discovered your blog and enjoyed this review of the movie of ‘Twelfth Night’, which I have just seen. I’m having something of a Shekespearean year too, though not quite on your scale (I’m trying to watch a lot of productions and read those plays I hadn’t got round to so far), so would be interested to hear how you are getting on. It takes a tremendous amount of time and energy. Make sure you love your subject because it takes awhile to build an audience. But if you write from the heart, people will come!